RUSH: One thing here. 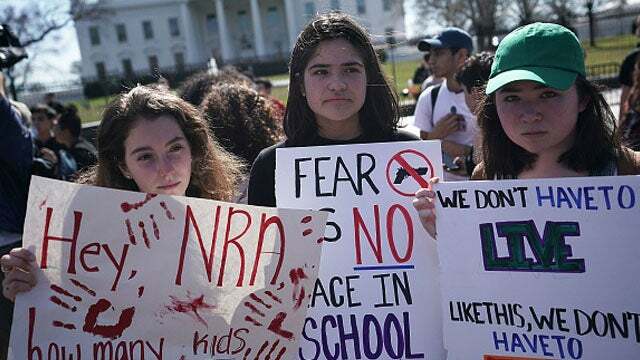 I just found out the students’ March for Our Lives next month in Washington, March 24th, guess what? There’s a problem. There’s already another event that got the permit for the mall in Washington that day. Yeah. The March for Our Lives will not take place on the National Mall because it’s already been booked for another event. It’s a bunch of filmmakers doing something. And I’m gonna predict right now that this film crew that has March 24th booked will, quote, unquote, volunteer to give way to the Florida students before all is said and done. You know, book it, my prediction here, March 2nd that the students will not be denied, that the filmmakers will get the Barack Obama filmmaker treatment. RUSH: Now, a clarification. I’m not saying the filmmakers who have the mall booked on March 24th are gonna end up in jail like the filmmaker of the video that Obama claimed caused Benghazi. I’m just saying that they’re gonna “volunteer,” quote, unquote — the filmmakers will volunteer — to give up their date on the mall. Or maybe they’ll combine their efforts and film the children and their march with the left-wing organizers of the march. Washington Post: "March for Our Lives" Gun-Control Rally Bumped from Mall by "Talent Show"